Watch Those Reports of 'Billions' of TV Viewers Lots of people around the world will tune in on TV to watch the Opening Ceremony at the Winter Olympics in Turin. But not as many as some people say. Estimates of up to 2 billion viewers are wildly exaggerated. 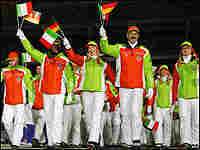 The delegation of Germany arrives during the opening ceremony of the 2006 Winter Olympics at the Olympic Stadium in Turin. 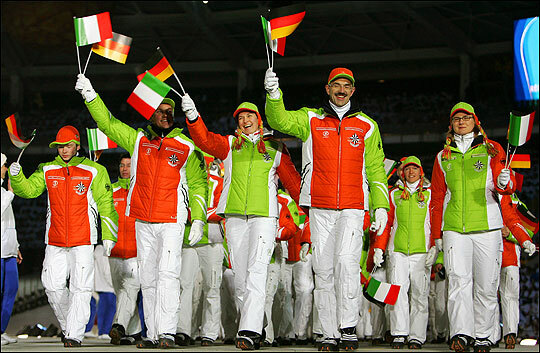 Lots of people around the world will tune in on TV to watch today's Opening Ceremony at the Winter Olympics in Turin. But not as many as some people say. A D.C. sports talk radio announcer I heard this morning said the event will reach an estimated worldwide TV audience of two billion. An Associated Press story reports the same thing. On NBC's Today Show they were saying the event could be watched by 2 billion people. "Could" is the word to pay attention to here. Two billion people "could" read this blog. Two billion people could also decide to stand up to do jumping jacks at the same time. But you know what? It's not going to happen -- the blog (unfortunately), the jumping jacks or the TV audience for the Opening Ceremony. First off, any estimate of the global TV audience is a pure guess. Nielsen doesn't do its thing in Karachi or Kabul. But it's safe to say it won't be 2 billion. Here's why: a total of 57.5 million American and Canadian viewers watched the Opening Ceremony at the 2004 Summer Olympics in Athens. That's about 17 percent of the combined populations of the two North American countries. Both are, of course, prosperous countries with lots of TVs, and lots of athletes who do well in the Olympics. In other words, a larger-than-average market for the Olympics. So for 2 billion people to watch the Opening Ceremony in Turin, viewership would have to be nearly twice as high outside the United States and Canada as in those countries. A total of 30 percent of the entire world would need to tune in. That requires a stretch of the imagination where we envision entire villages in India and hamlets in Bolivia gathered to watch the wintry festivities in Italy. The world is globalizing fast, but not that fast. Here's another reason the 2 billion figure is, um, wishful thinking. According to published reports, there are some 1.1 billion households with TVs in the world. Unless most of them are enjoying Winter Games house parties today, stocking up on Bud, ordering in from Domino's -- the numbers just don't add up. Tonight, I'm going to sit back and watch the Opening Ceremony on NBC. On tape delay, of course. There's a decent chance you will, too. Just don't think that you'll be one of 2 billion.